Thought I would share with you some pics that Captain John Little sent over to share with you. Checkout this alligator looking for some dinner. Tim Hollister from Kyle, Texas caught this nice 27 1/4th Redfish at the Land Cut. 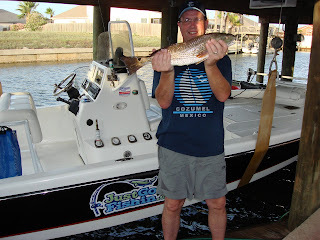 Captain Don Hand Guided Tim and his family on a GREAT day on the water. Congratulations Tim! Decided to take a few hours and sneak out on the water to just relax from all the noise. Thought I would stay close and cruz over to the Boat Hole. 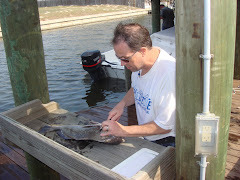 Using live shrimp I drift fished until I caught a nice rat red. Then I power poled to fish that area. 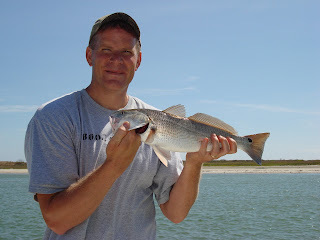 Caught several small Trout & Reds then I was able to hook-up on a 23" Redfish. Shindledecker caught this dolphin in the Gulf and other Kings fish. Great offshore adventure the Burkharts and friends in the Gulf of Mexico. Great weekend at the CCLEFT event this year. 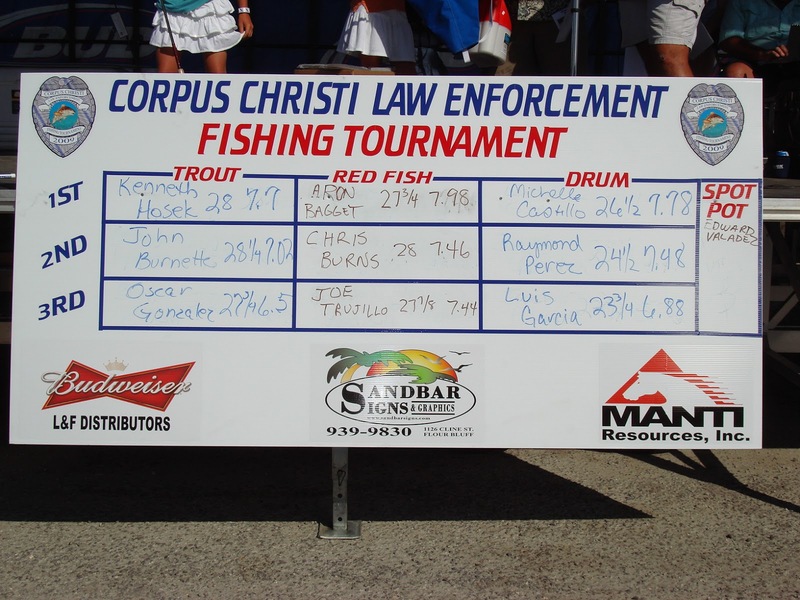 There were a lot of fish caught this year and very close in the standings. Hope ya'll enjoy viewing the pictures for this year. Friday night festivities were great with Registration, Food, Beverages, Silent Auction and Raffle. About 600 to 700 people in attendance. Check-out all the pictures and catches at our facebook page. JustGoFishin.com really enjoyed being there and the opportunity to take several photos of the Corpus Christi Law Enforcement Fishing Tournament for 2009. Awesome, Congratulations to all the winners and a BIG thanks to the Directors of CCLEFT. Gary Nelson, LDS CES Director, Just moved down from Utah and is getting acclimated to the Texas outdoors. 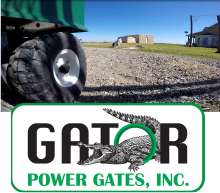 Gary has been an avid freshwater fisherman and loves to fly fish. We also had Elder Hudnol & Sister Hudnol join us on this outing. We went to Center Reef in Baffin Bay and there wasn't much to going on there so we moved to the Land Cut and caught several fish. Many of them were undersized. We managed to come out wi9th a few keepers for dinner. 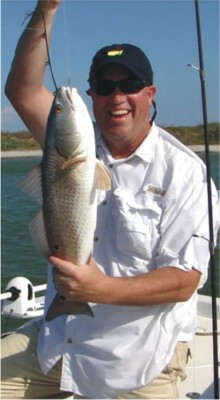 This is Gary's first keeper Redfish. About 21 inches. 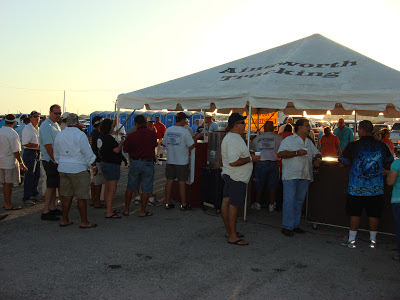 Port Isabel Fishing with Fred Rodriguez of the South Texas Sportsman & Robert Castaneda of Livingston Lures. Caught these nice trout & red on Livingston Lures Pro Sizzle Top Waters. Thanks for sharing Robert!